We guarantee our in-store trees, shrubs, and perennials (excluding houseplants and bonsai) for one year from date of purchase. Your receipt is required at the time of the exchange, so please keep a copy of your receipt in your records. Our Shop Online plants are NOT covered under this guarantee and cannot be returned. All returns and exchanges must be accompanied by the original receipt. We cannot look up your receipt in our system, so you must bring the receipt to show that the original purchase was within one year. For dead or non-resellable trees, shrubs, or perennials, store credit or a replacement plant will be issued. Store credits are valid for one year from the date of issue. Credit card purchases will be returned to the card. Cash purchases will be returned with cash. Check purchases, a store credit will be issued if returned is within 10 business days. Gift Card purchases, a store credit will be issued. The Family Tree Garden Center offers safe, professional delivery of your plants and products in our enclosed truck. $1 to $499 of purchased plants and materials (excluding sod and straw) will be delivered within 10 miles of the store for a $50 fee. Every mile over 10 is an additional $1.50 per mile. $500 or more of purchased plants and materials (excluding sod and straw) will be delivered within 10 miles of the store for FREE! Every mile over 10 is an additional $1.50 per mile. 1 pallet of sod will be delivered for $175 within 10 miles of the store. Every mile over 10 is an additional $1.50 per mile. 2 pallets of sod will be delivered for $350 within 10 miles of the store. Every mile over 10 is an additional $1.50 per mile. 3 to 18 pallets of sod will be delivered for $175 total within 10 miles of the store. Every mile over 10 is an additional $1.50 per mile. Looking for something special and can’t find it anywhere? We’ll try to find it for you! Our buyer will check with our suppliers to see if we can find your special request. Please fill out the special request form with one of our cashiers. Professional Landscapers: All landscapers must be set up in our system and approved by management before discounts will be given. Approved landscapers will receive 20% on non-sale items with a Tax ID. No discounts are given on Pine Straw, Wheat Straw, Sod and Grass Seed. Senior Wednesday: Save 10% on all regular-priced merchandise every Wednesday if you’re at least 62 years old. Seed, sod, straw, gift cards, and sale prices excluded. Military Discount: Save 10% on all regular-priced merchandise every day with a valid military ID. Seed, sod, straw, gift cards, and sale prices excluded. 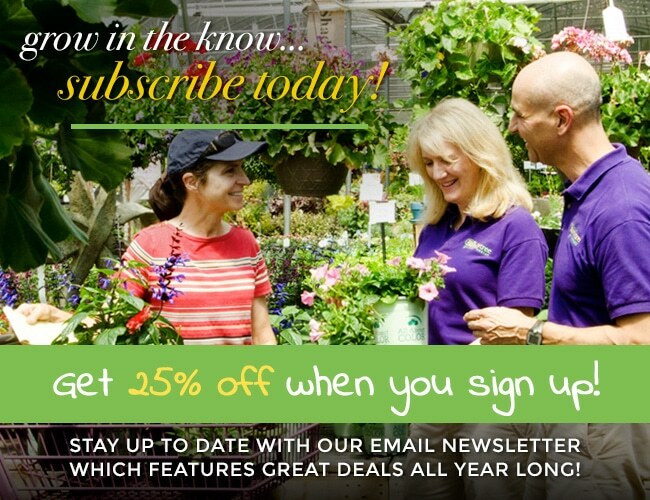 Master Gardener Discount: Save 10% every day with a valid Master Gardener’s ID. Seed, sod, straw, gift cards, and sale items excluded.